Matera has received CARE Cash transfer assistance. She used it to build a one-room-house for herself to protect her from animals, storms and rain. 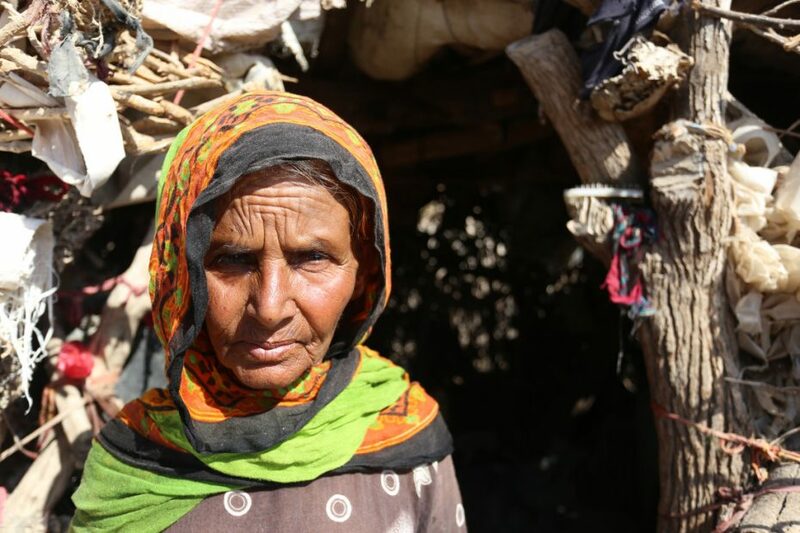 CARE’s Karl-Otto Zentel visited Yemen in 2017 and answers five burning questions about the crisis affecting more than 22 million people. To what extent has the situation for Yemenis deteriorated? After another two years of war, the current situation is disastrous. More than 10,000 people have died so far during brutal conflict, and about 17 million people can’t survive without humanitarian aid. Many people reported there are no possibilities to earn money in the cities and without money there is no food. At the same time, military actions near the coast have increased, greatly limiting the capacity to deliver food in these areas. Routes in the north are especially affected. Many families just don’t know how to nourish their children anymore. What are the main difficulties aid workers face? To provide humanitarian aid in a country torn by an ongoing civil war is exceedingly difficult. In particular when attacks target and destroy critical infrastructure. Many colleagues in Yemen report it is often challenging for the teams to get access to the people who desperately need help. Moreover there are not enough resources to help everyone. Therefore the teams have to make tough choices: Who gets priority when more than 14 million people are starving? My deepest respect for my colleagues and their stamina. Most of them are personally affected too. They themselves have had to flee, and their houses were bombed. But still, they help wherever they can and care about the future. How can aid be provided in the middle of a war? There is no end to the war in sight yet and food assistance will probably be needed for a long time. People need to have at least some income to survive. Therefore CARE has “Cash for Work” programs. Whole villages benefit from the program and people can earn a reasonable income. An example: on our way to the villages in the Wadha district we used a road which was extended and repaired as part of a cash for work program. With this road, the village is better connected to markets and healthcare facilities. Three hundred villagers, both men and women, supported the construction. The program and construction gave them the opportunity to obtain a short term income for their families, while helping the village as a whole. Yemen is sometimes called a ‘forgotten’ crisis – Do the people in Yemen agree with that? Yes, definitely. Many people asked me why no one cares about Yemen. Of course the Yemenites notice there are crises which always make the headlines and others which are rarely mentioned. They wish the international community would pay more attention to their current dire situation. They want a comprehensive political solution, because this will be the only way to end the suffering. What experience did you find most concerning? I’ve met many impressive people here in Yemen, but many of them are being pushed to their limits. Some villagers showed me their food cards, which highlighted there were just four distributions of food and money in their village during the past seven months. The villagers are concerned that funding for this program will soon finish. It is still six months until they are able to harvest and there are already people in this village who are starving. They cannot find paid work nor can they go anywhere else to assure their livelihood. They rely on humanitarian aid, like 70 per cent of the people in Yemen. Yet only about 15 per cent of the required 2 billion Euros the humanitarian response in Yemen needs has been provided so far. This is a situation we are extremely worried about. CARE is delivering lifesaving water, food and emergency relief to families in desperate need in Yemen. Click here to learn more.